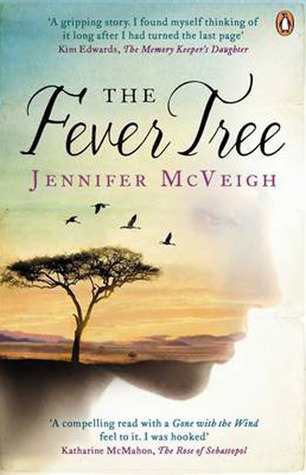 I just finished reading The Fever Tree by Jennifer McVeigh. Quotes from reviewers likened it to the African version of Gone With the Wind and as that is one of my all-time favourite books, I had to give this book a read. I can see where they got the comparisons from. Both books contain a female protagonist who is selfish and thoughtless. Both books deal with the theme of slavery and have their heroines go through severe hardship. And both books contain love triangles where one man is a scoundrel and the other the epitome of goodness. That is where the comparisons end. After all, how can a book of 346 pages (The Fever Tree) compare with the epic saga Gone With The Wind which runs for over 1, 000 pages? Scarlett O’Hara is one of the best literary characters ever created, as is Rhett Butler. The Fever Tree doesn’t come close to matching GWTW‘s brilliance. BUT, standing on its own merit, The Fever Tree was still a good read. The book is set in the 1880s and follows the plight of Frances, the daughter of a wealthy man. She has been spoiled all her life. When her father dies, he leaves nothing but debts and suddenly Frances is faced with the prospect of going to live with her father’s poor Irish relations – or marrying a man she has known from childhood and despises. Edwin is now a doctor working in the Kimberley region of South Africa, fighting the outbreak of smallpox and the injustice and brutality he sees inflicted upon the African workers used to mine diamonds for white men. Circumstances leave Francis with no other option but to take up Edwin’s offer and travel from England to South Africa. As Edwin has already returned to Africa, Francis travels alone for the voyage. On board the ship she meets a handsome charmer called William. He is everything that Edwin is not and she soon falls in love with him. Once in Africa, Frances is shocked by the conditions there and the vast emptiness. She does nothing to learn to like her new husband or to offer him any practical help. She can’t mend, cook or do anything domestic. But little by little, she finds an appreciation for the land’s beauty. Then a whole lot of things go wrong and Frances refuses to mature or see what is staring her in the face. I struggled to like Frances yet still felt pity for her situation. But as the book went on, I felt like I wanted to shake her out of her apathy. Also, the voyage to South Africa took almost half the book. I think that it could have taken less time to get there! The Fever Tree explored the lengths men will go to to make their fortunes. The diamond mines of the Kimberley were hellish places built on human suffering. The writing truly evoked the beauty and harshness that is Africa. I’m glad I gave this a read but it should be judged on its own merit instead of being compared to a classic. Next Article What comes first for you? The book or the movie? Hi there, thank you for liking my post! You made my day! Your blog is great!! Been wanting to broaden my reading list and am glad you did so many reviews on so many great books out there!